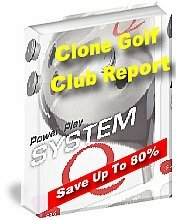 Learn How Choosing the Perfect High Quality Clone Golf Clubs and SAVE Up To 80%! Fill in the Form below and receive the Clone Golf Club Report and the first Secret Tip within Moments! We respect your privacy. Your e-mail will never be rented, traded, sold or swapped.